A peer-reviewed quarterly philosophical e-journal edited by the Faculty of Education of Charles University. Published in January, April, July and October. Texts to be included in quarterly issues are accepted before 15th December, 15th March, 15th June and 15th September. E-journal PAIDEIA was licensed as peer-reviewed scientific journal by the Research and Development Council of the Government of the Czech Republic. Contents of e-journal is archived by the National Library of the Czech Republic. Published since 2004. Orbis scholae is a journal published by Charles University in Prague in cooperation with Masaryk University in Brno. It features articles on school education in the wider socio-cultural context. It aims to contribute to our understanding and the development of school education, and to the reflection of teaching practice and educational policy. One issue per year is published in English as a special (monothematic) issue to which guest editors invite papers through “calls for papers”. Starting from 2010, Orbis scholae is indexed in the international database Education Research Complete (available through EBSCO). Starting from 2013, Orbis scholae is included in the CEEOL database. Since 2013 Orbis scholae is listed in SCOPUS. Starting from 2015, Orbis scholae is included in the ERIH PLUS. Starting from 2018, Orbis scholae is included in the DOAJ database. The journal is archived in Portico. The journal Pedagogika has been coming out since 1951 as a specialist academic journal on education which respects contemporary standards of quality of academic publishing. Originally it was published by the Ministry of Education but it soon came under the Comenius Institute of Education of the Czechoslovak Academy of Sciences. Since 1994 it has been published by Charles University in Prague, Faculty of Education. The journal Pedagogika contributes to the development of academic understanding in education and to the cultivation of professional opinions. This it does through both the overall selection and the orientation of articles, the rigorous demands made on them and observation of ethical principles of publishing. The journal publishes reviewed academic studies, discussions on current issues, reviews of relevant publications as well as analytical reports on important events in the professional community. Pedagogika publishes the following types of academic studies: theoretical, historical, review, methodological and research papers. Pedagogika journal is usually published four times a year. Two issues are monothematic, one being interational with texts published in foreign languages. Pedagogika journal also publishes foreign language texts in standard issues. 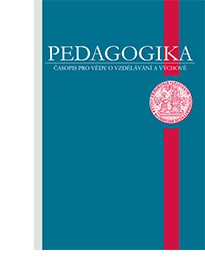 Pedagogika journal is indexed in international databases DOAJ, ERIH PLUS, EBSCO and Ulrich’s. The mission of the sciED journal is to publish original articles focusing on both theoretical and empirical research in the didactics of science (namely biology, environmental studies, geology, physics and chemistry) and mathematics. The editorial board also welcome papers elaborated within Ph.D. (or Master's) studies and studies from abroad. Scientia in educatione respects the Code of Conduct and Best Practice Guidelines for Journal Editors recommended by the Committee for Publication Ethics (COPE). Scientia in educatione does not tolerate plagiarim or other unethical behavior. Editors, authors and reviewers follow the principles of the Publication Ethics and Malpractice Statement. On August 15 2014, Scientia in educatione was included in the ERIH PLUS database.